Norwegian Air Shuttle has once again won approval to begin flying new routes between Europe and the United States, but labor unions and some lawmakers say they will fight the U.S. Transportation Department's decision, which follows three years of controversy. 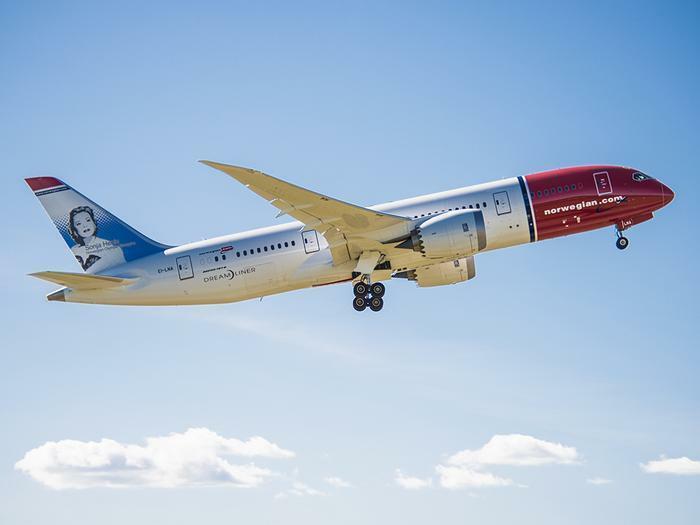 Norwegian called the approval "long overdue" but said the action "finally makes it possible for us to plan the Cork to the U.S. routes we, and many others, have been looking forward to." The cut-rate carrier won preliminary approval in April, but labor unions, airline trade groups, and presidential candidates loudly opposed the idea and its fate was in doubt as the Obama Administration entered its final days. At stake for consumers is the kind of "backpack fare" that hasn't been seen on trans-Atlantic routes for decades. Icelandic Airways and People Express once offered cheap fares with minimal restrictions, but major carriers now have a lock on the routes and have bitterly resisted Norwegian's attempt to get in on the action. Labor unions and U.S. carriers accuse Norwegian of basing its shuttle operations in Ireland to evade labor unions and hold down costs, but the European Union has defended Norwegian and accused the U.S. of violating the Open Skies pact by dragging its feet. “Today’s decision betrays America’s aviation workers by granting a rogue, flag-of-convenience airline a permit to serve the United States," said Edward Wytkind, president of the Transportation Trades Department, AFL-CIO. "Unless reversed, this decision threatens a generation of U.S. airline jobs and tells foreign airlines that scour the globe for cheap labor and lax employment laws that America is open for business." The decision possibly avoids a crisis for the incoming Trump Administration by stilling European objections but could create a political backlash at home if critics say the approval violates Trump's "America First" pledge. Trump is also likely to hear complaints about alleged state subsidies for Middle East airlines that are building new routes into the U.S. The Southwest Airlines pilots union has already called on Trump to reverse the action and send Norwegian packing. FedEx and some other carriers said they feared the Norwegian stand-off was endangering the Open Skies pact that has enabled them to fly to more destinations than would otherwise be the case. The Transportation Department said the case was among the most complex it has ever handled but said that "bilateral obligations," presumably meaning the Open Skies, left it little choice but to approve the application. Besides cheaper fares, Norwegian Air Shuttle will be using smaller planes than other trans-Atlantic carriers. It plans to fly the new Boeing 737 Max jet on at least some of the new routes. Whether consumers will accept -- or even notice -- the switch to a smaller, one-aisle aircraft isn't known, but it is expected they'll respond favorably to the lower fares and increased competition Norwegian promises. "Above all, [the decision] is a victory for millions of passengers who will benefit from more choice and lower fares. We now look forward to working on our plans for Norwegian's continued expansion in the US, delivering the flights, jobs and economic boost we always promised we would,” the Norwegian spokesman said. Norwegian has been flying a limited number of U.S. routes while the application for expanded service has been pending, and it has learned that some U.S. destinations are just too hot to handle. In November, the discount carrier suspended four routes between Las Vegas and European cities because the temperature at McCarran International too often exceeded 104 degrees, making it too hot for its fully-loaded Boeing 787s to take off. The midday flights were often delayed for hours until the mercury dropped, cutting into profits and disrupting the airline's schedule. Part of the problem was the carrier's success. Most airlines have about 200 seats on the 787, but Norwegian packed its planes with 291 seats, making the airplane too heavy to achieve lift off in the searing desert heat. The Las Vegas Review Journal said Norwegian planned to resume "seasonal service" to the desert hot spot in November 2017.